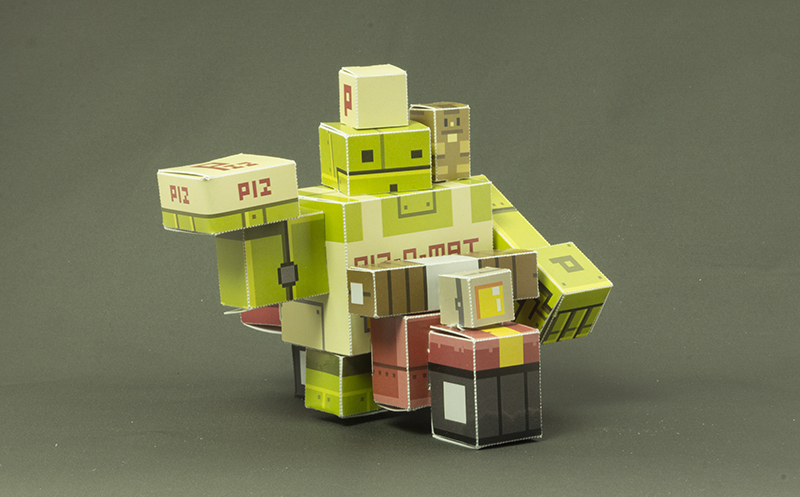 ← Paper Robot Piz-O is READY for sale! How my year went by. There we were. At the dawn of 2016. A fresh and new year full of promise and opportunity. 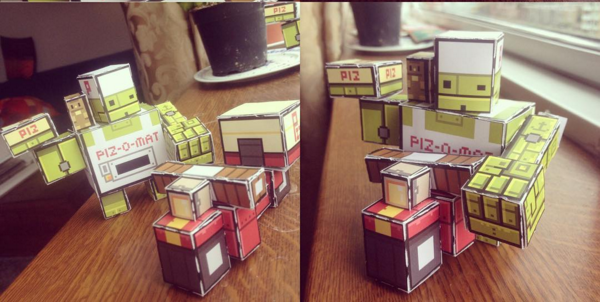 The resolution was to make multiple papercraft robot figures. Let’s see what happened. 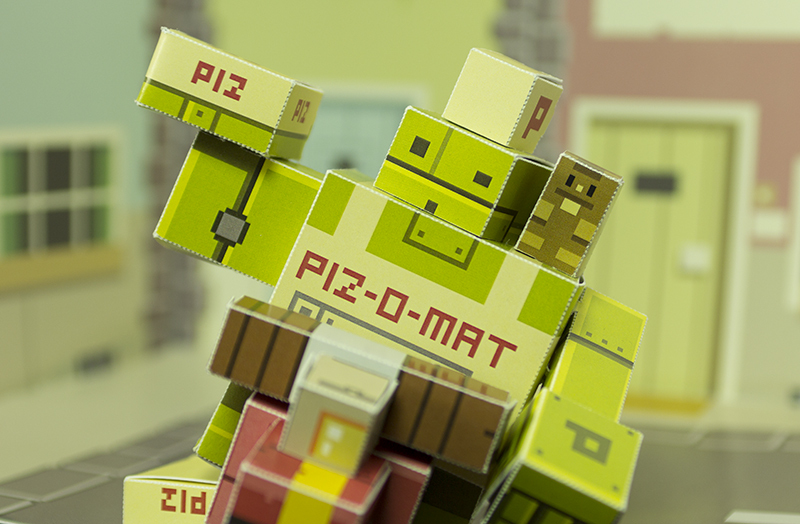 On the to-do list were Some Munchybots and a wicked Mutant Gangland robot. One that would require no glue or scissors to assemble. I was gonna be very hard on that because I discovered I hate cutting and glueing. There is a workshop near my place that lets people make use of their laser cutter. 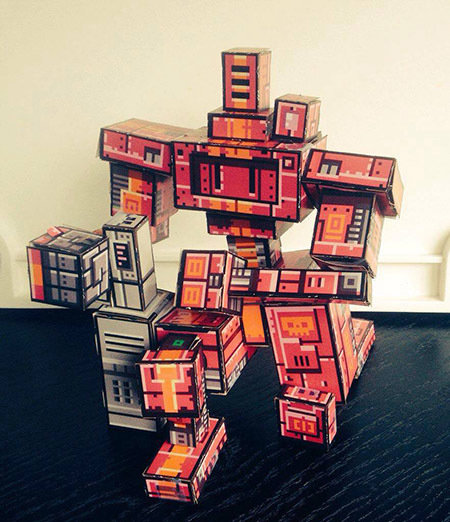 I thought that might be way to create papercraft sets. So the year began. In the first weeks I started building. This is where we arrive at my first mistake. Signal was too big and too complex. Too much so to test a new technique (laser cutting and glueless folding) on. after doing the pixel art textures and adding cut lines in Illustrator I printed it and took it to the workshop to have it cut. Things went wrong with the proportions and the cutlines. They were either too big or too small. I went back home, Changed the design, printed and cut again. Wrong again. and again and again. At one point I managed to make a nice robot that fell apart when you touched it and that’s where I aso kinda fell apart. There was just too much to re-do every time. Working with the laser cutter was a lot of fun but it was not cool to work on borrowed time. There was always this clock looming over my shoulder. The process also left burn marks on the paper so every prototype smelt like fire. Which was nice but you could actually see the scorch marks. It was time to find a solution. Maybe a machine that could do the same thing but with a knife. Does that even exist? It does. The Silhouette Cameo is a consumer grade knife plotter. During earlier researching I heard about it but what exactly could it do? I asked some friends who owned one and they were very helpful. And yes: It could do exactly what I wanted it to do. Hearing this was a very happy moment. There was one problem though. It cost around 300 Euros. Was I gonna buy a machine again for one of my new hobbies? I dived into things before. At the back of my basement there are boxes full of stuff for things I used to do. painting, music, sculpting. Was this just one more of those personal fads? To be honest I still don’t know but hey I promised the internet (and myself) I was gonna make toys. My last Penarium earnings came in at just the right time and I spent it right away on my debts and the machine. If I had to describe the prototype phase I’d say it was terrible. I rolled out robot after robot to see what I needed to improve in order to make a good product. Turns out that list was pretty long. Not only that: I had to learn how to work with a completely new machine. You enter a sheet of paper (that’s glued to another sheet of plastic functioning as the bed) and then press a button to have it cut on the paper where you told it to via a vector file. Every time I went through this process I was fingers crossed. Even when you put in a design that’s good there’s still tons of things that can go wrong with cutting out the thing, With the bed, With the blade, With the placement. I made all the mistakes there were to make and wasted a lot of sheet by making mistakes. So much that sometimes I just wanted to throw my computer and cutter out of the window and live in a cave. This phase was the longest of all. It was a struggle but it did exactly what it had to do: Bring to light design changes for improvement. It was this phase where I started to feel more like an engineer than an artist. All of the technical difficulties on both the design and the production process were beaten by just looking at what went wrong, fixing it and testing it all over again. And then I saw that hey, The outline on this robot looks really crappy and the way the seams are cut are crappy too. No idea why it took me that long to figure out but the backlines were removed again. The best improvement came in the form of a technique I stumbled on while googling the problems with my machine: The kiss-cut, A way of telling the machine to not cut a line straight away but rather every once in a few millimetres gently. The result is that you can bend the paper more easily and it gives a white edge of torn paper fabric. This is wonderful! It’s almost like an outline on itself. At this point I stopped printing the texture on paper and prototyped on blank sheets instead. It was cheaper that way. A few weeks later I rolled out the first prototype that made me happy. It was amazing. Nothing fell off. It could stand up straight. Nothing rambled when I shook it. Amazing! The feeling of relief was amazing and I ordered a pizza to celebrate. Then I refined and got some ideas like the addition of his scooter and a spare pizza box. All of these of course brought complications with them. I make it sounds like making this robot was one big struggle. Even though it’s true that I was sometimes frustrated and wanted to give up I feel extremely fortunate to have had the opportunity to work on my dreams. I just tried to fix problems as I came across them and started over again. Same with the package and the instruction manual. 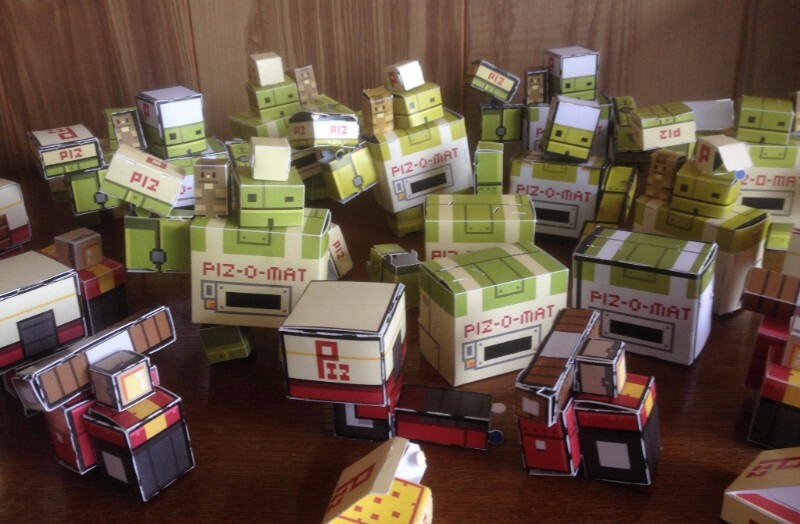 Truth be told it’s a bit harder to get right when you are as sloppy as I am but at one point I got a Piz-O set and a package and manual I was content with to sell. Except it was not the end of the ride. Putting it up on Etsy was exciting but when people actually bought the thing the pressure rose. To be honest I did not expect people to actually buy these. There was a batch of sheets ready to be cut but the idea of people having paid you and waiting on you to deliver to them was..whoa. That was new. And that’s where I am today. Having sold and shipped some units my room is restructured for easy producing and packaging. 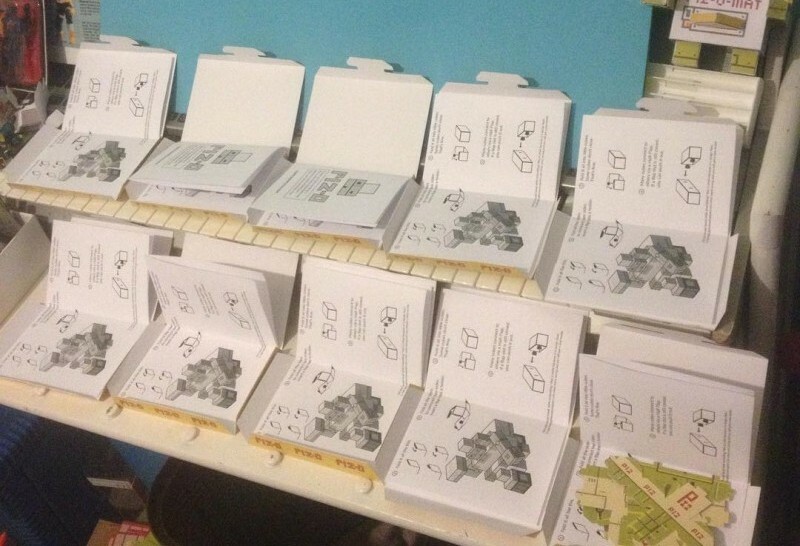 On top of that I set up a system to handle and print all the addresses of people who order. It was a bit of a surprise I could be this organised. The current challenges are finding new ways to reach potential buyers and the fact that my Cameo seems to have broken down. It’s a bit worrying and I am not sure how to solve it. Somehow we are 12 months into the ‘new’ year. That plan of making many things was not fully completed but I feel good. Somewhere in between I worked on logo designs, a custom Google Cardboard set along with a spherical view and a wicked trailer for Chrome Death (directed by Elise The). So what’s the resolution for next year? One more Munchybot and a new Signal. That one really deserves a good figure. Having some experience should help the process go faster next time right? Right? There’s also a lot of time reserved for making games. One in particular. My friend Michael Short approached me a while ago with a irresistible premise. All we can say for now is that it’s gonna be homage to G.I. Joe and it’s gonna be fun. Then there is Demolition. It’s in the fridge at the moment but it’s banging on the fridge door. Oh wait I promised myself I’d learn 3D. That did not happen much but it’s still the plan. But things rarely go to plan. Let’s hope we can have a nice new year. See you around.